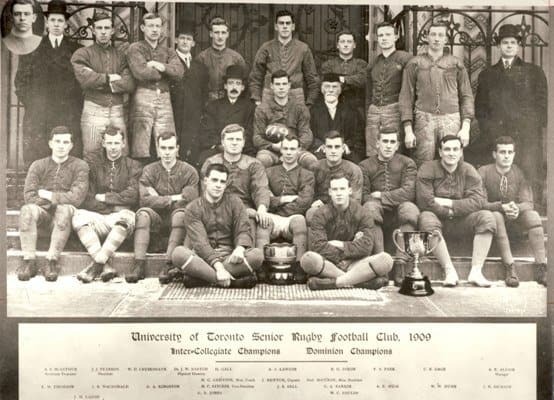 On December 4, 1909, the Varsity Blues triumphed over the Toronto Parkdale Canoe Club by a score of 26–6 in the first Grey Cup. Though this was the first Grey Cup game, teams have competed for a national championship since 1892. The game was played in Toronto at the old Rosedale Field grandstand stadium in Toronto. Today at Rosedale Park, there stands a plaque commemorating where the game took place. It is a fascinating tale and an important moment in Toronto and Canadian sports history. The Varsity Blues went on to win three more Grey Cups, and two of those next three came immediately after this win — completing the ‘threepeat.’ Two years later, Varsity Stadium opened. The Grey Cup itself didn’t come into existence as an award intended for football. Rather, the cup was initially destined for a hockey competition. Another cup ultimately went for that hockey competition, and so, His Excellency Earl Grey, then Governor General of Canada, instead offered the Grey Cup for amateur rugby football in Canada. The cup wasn’t ready to be given to the winners of the 1909 game, and had to be presented three months later, in March 1910. Newspaper reports at the time seemed to omit mention of the Grey Cup itself, and instead referred to a “Canadian Championship.” The Canadian Football Hall of Fame claimed that Lord Grey had entirely forgotten that he donated the cup for the competition. Another funny bit of history is that the Varsity Blues refused to give up the trophy until 1914, when they were beaten by another Toronto team, the Argonauts. In those days, football was entirely amateur, unlike today, when professional football like the NFL dominates the public psyche. According to accounts of the game, the Varsity Blues were the clear favourites going into the game. Heritage Toronto says that there were “many in the Toronto press proclaiming them to be the best football team Canada had yet produced.” Supposedly, there were a wide variety of fans in attendance for the game, and Varsity Blues supporters produced new fan songs and chants for it. Fans and attendees came from out of town to watch the game. For a stadium with the capacity of only 3,400, it managed to squeeze in 3,800 supporters for the game. The semifinal game between U of T and Ottawa drew a staggering 12,000 fans into the stadium. This was supposedly the largest crowd to have watched a football game at that point in time. The match itself was a tight affair going into halftime. The Varsity Blues led 6–5 and attendees saluted the Parkdale players for playing valiantly against a perceived superior Varsity Blues team. Parkdale’s aim was to neutralize the Blues’ main threat — Smirle Lawson, a running back who brought the Blues plenty of success in this time period. Parkdale achieved this by putting defender George Barber on him, a skilled player who played in what was then known as ‘English style,’ where players would tackle at the hips. The second half was a different story. The Blues ultimately rallied to victory on a score of 26–6. Lawson scored on a 50-yard touchdown run in that second half. While Lawson was the standout player throughout the season, the team’s success in that second half apparently went to their kicker, Hugh Gall. With the conclusion of the game, the Varsity Blues became the first winners of the Grey Cup. They finished the season undefeated at 8-0 and received a trophy supposedly worth $48 three months later; adjusted for inflation, that is almost $1,200 in 2018.